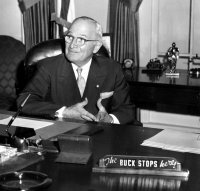 President Harry S Truman looked around the Oval Office. His eye took in the rich, red drapes, the deep carpet in the same shade, the mahogany of the furniture. He glanced over each shoulder – right, left – to take in the Stars-and-Stripes and his own Presidential standard, and reflected that the room was still very much to the taste of Roosevelt his predecessor. How could it not be? FDR was such a dominating personality. He asked himself whether he had the courage (or the energy, or the time…) to redecorate. Perhaps at this moment he doubted himself a little, but Truman was indeed a man of character. He looked down at his desk. Yes, here was the new Truman Presidency, ordered, workmanlike, symmetrical – that’s how he would be. A place for his pen, a place for his presidential blotter, a place for everything, yes everything was in order, so why was he frowning? “Something is missing,” he thought. His frown deepened when he caught sight of something he had been trying to avoid looking at. A tarpaulin had been laid on the carpet, and on that was the carcass of a freshly-killed white-tailed deer, a fine male with a single bullet hole. It was a gift from an eager, young White House aide who had heard that the President liked hunting. In that the aide had miscalculated – Truman shot grouse, not deer. The President got up and walked round to the front of his desk. The carcass would not go away of its own accord, it had to be dealt with, a decision had to be made and it was the Commander-in-Chief who had to make it. No one else would make it for him. “What the hell use would there be in a President who knew how to skin a damn deer?” he asked aloud. The walls of the Oval Office echoed his rhetorical question. He looked down at the white-tailed buck, then to the empty space on his desk. His frown melted. An idea formed in his mind and he made a decision. He lifted the Presidential phone and spoke to his secretary Matthew Connelly.